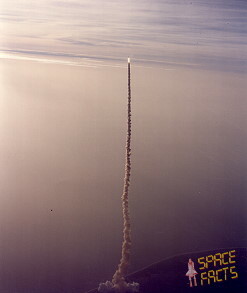 Launch from Cape Canaveral (KSC); landing on the Edwards AFB, Runway 23. The primary cargo being flown on this mission included three communications satellites. These were Arabsat-1B (Arab Satellite Communications Organization); Morelos-1 (Mexico); and Telstar-3D (AT&T Corporation). 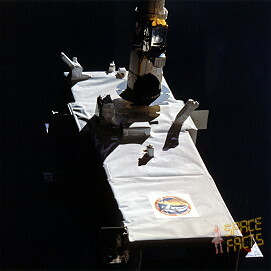 Also carried was the SPARTAN 1 carrier module, designed to be deployed from the orbiter and fly free in space before being retrieved. SPARTAN 1 included 140 kilograms (300 lb) of astronomy experiments. The crew successful deployed the three communications satellites Morelos-1 (Mexico) on flight day 1, Arabsat-1B (ASCO, the Arab League) on flight day 2 and Telstar-3D (AT&T) on flight day 3. All three communications spacecraft were spring-ejected from the cargo bay of the orbiter. On each, a small attached rocket called the Payload Assist Module was ignited about 45 minutes after deployment. 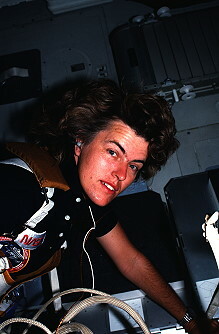 Between deployment and PAM ignition, the Shuttle was maneuvered to a safe distance. The end effector camera on the robot arm was used to observe the perigee kick motor firing on each of the spacecraft. 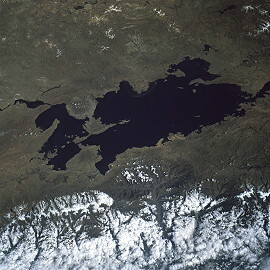 Morelos was one of two spacecraft scheduled for launch by NASA's Space Transportation System for the Secretariat of Communications and Transportation, Mexico. It provided advanced telecommunications to the most remote parts of Mexico including educational TV, commercial programs over the national TV network, telephone and facsimile services, and data and business transmissions. Television programming originated in at least 12 principal cities. Cultural, educational and athletic events were televised nationwide. 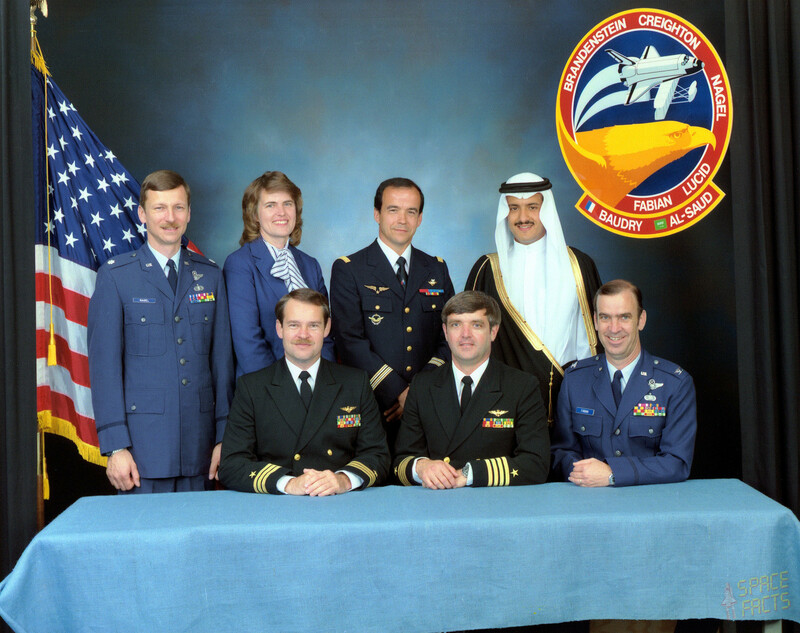 The Hughes Space and Communications Group was prime contractor. Morelos was a spin-stabilized gyrostat design with a despun antenna and communications payload. Two cylindrical solar panels, one fixed and one extendable supplied prime power to the spacecraft. At launch, Morelos was mated to the PAM-D stage and the antenna reflector and aft solar panel were stowed. The PAM-D stage supplied the necessary impulse for injection into a transfer orbit. 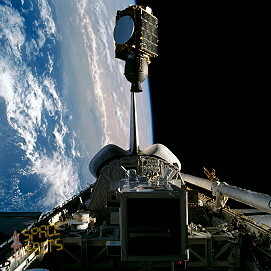 Shortly after separation of the spacecraft from the orbiter Discovery, an omnidirectional antenna was deployed. Morelos' two cylindrical solar panels telescope when the spacecraft was in orbit. In launch position, with antenna reflector folded down, Morelos was 9 ft., 4 in, (2.87 meters) high. 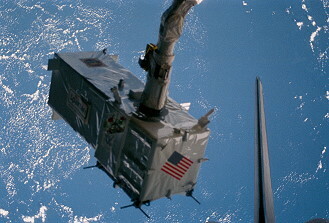 In orbit with panels extended and antenna erected, it was 21 ft., 8 in. (6.64 meters) high. It is 7 ft., 1 in. (2.16 meters) in diameter and weighed 1,422 lb. (645 kg) at the beginning of life in orbit. Four thrusters using 293 lb. (132.9 kg) of hydrazine propellant provided orbit and attitude control during the satellite's 9-year planned mission life. From low Earth orbit, the cradle's protective sunshield was opened and a spin table at the base spinned the satellite to 55 rpm to provide gyroscopic stability. Four springs pushed the satellite into space; 45 minutes later, an onboard sequencer fired the McDonnell Douglas payload assist module. A Morton Thiokol Star apogee kick motor placed the satellite into a circular synchronous orbit. Near its operating position, the reflector antenna and electronics shelf were despun and achieve close pointing accuracy. The satellite drifted into final orbit and was placed in operating position with onboard thrusters. Arabsat was a communications spacecraft designed for launch by the Space Shuttle orbiter. Once deployed, it was boosted to its operational synchronous orbit of about 22,300 statute miles (38,888 km) by a Payload Assist Module-D (PAM-D). Main body of the spacecraft was rectangular with deployable solar arrays extending north and south along the pitch axis in flight. A graphite epoxy central cylinder transmits loaded from the satellite through the adapter to the launch vehicle. The cylinder also housed the propulsion system's propellant tanks, the antenna feed and reflector brackets for high stability. Two solar array wings were independently oriented toward the sun by rotational drive assemblies. The arrays were deployed once the spacecraft has ended the transfer orbit phase of flight. A low-thrust, 100-lb. (45.3 kg) bipropellant apogee engine was in the main body. Providing a high specific impulse, it was fired at the transfer-orbit apogee to arrive at the precise geosynchronous orbit. 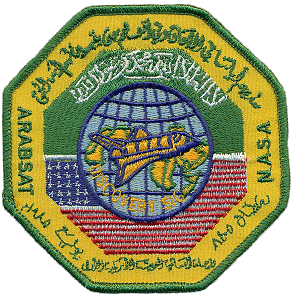 About 80 seconds after deployment, when Arabsat was about 200 feet (60.9 meters) from Discovery, the PAM-D was jettisoned by a signal from the master control station in Riyadh, Saudi Arabia, through the COMSAT Launch Control Center, Washington, D.C. Actuators then deployed Arabsat's solar panels. The Arabsat spacecraft weighed 2,800 lb. (1,270 kg) and the PAM-D, 4,863 lb. (2,205 kg). Sultan Salman Al-Saud, the Saudi Arabian payload specialist was not involved in the deployment activities of Arabsat. Designed for all types of domestic communications, the Telstar 3 satellites operated in the 6/4 GigaHertz C-band and served the continental United States, Hawaii, Puerto Rico or Alaska, depending on exact orbital placement over the equator. Each satellite was able to relay hundreds of video teleconferences, 24 color television programs or billions of bits of high speed data and facsimile signals. The third Telstar 3 was placed at 125 degrees w. longitude. It had a total of 24 working transponders, the equipment that receives and transmits communications signals, as well as six amplifiers held in reserve. In addition, improved batteries and solid state amplifiers allowed the Telstar 3 series of satellites to operate 3 years longer than the previous generation of satellites - for 10 rather than 7 years. The Telstar 3 series of satellites was designed by AT&T Bell Laboratories and built by the Hughes Aircraft Corp. using the Hughes 376 spacecraft. Each Telstar 3 satellite consisted of two primary sections containing the communications units and the support systems, surrounded by two concentric cylinders. 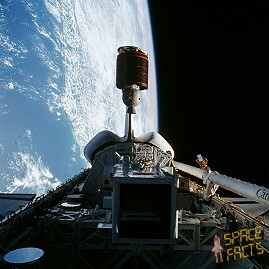 Once in space, the outer cylinder droped down about 6 ft. exposing the solar cells on the inner cylinder. With its antenna fully deployed in space, the satellite had an overall length of 22.4 ft. (6.8 meters) and a diameter of 7.1 ft. (2.16 meters). The two cylinders were covered with 15,588 solar cells. When the satellite was in the sun's path, these cells, thin silicon chips, coverted solar energy to electrical power to energize the satellite. When not operated by solar power, the Telstar 3 satellite used nickel-cadmium, long-life batteries. The Telstar 3 spacecraft used a PAM-D for transfer orbit insertion. Ground controllers at AT&T's Hawley, Pa., Satellite Management and control Facility monitored the satellite until it reached a selected apogee, or high point, at which time they fired the onboard apogee kick motor to circularize the orbit at the geosynchronous altitude of 22,300 mi. 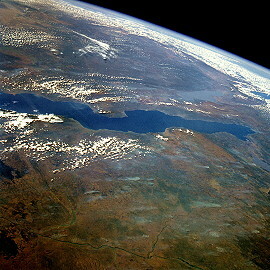 (38,888 km). The astronauts used the Remote Manipulator System (RMS) to deploy and later retrieve the SPARTAN 1-01 satellite which performed 17 hours of x-ray astronomy research while separated from the Space Shuttle. 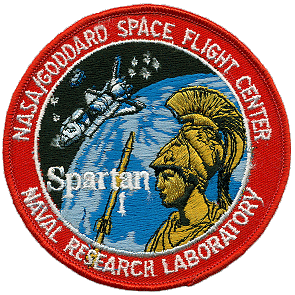 SPARTAN was designed to carry a variety of experiments. 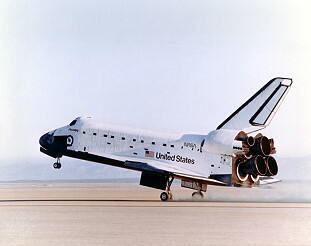 The name was an acronym standing for Shuttle Pointed Autonomous Research Tool for Astronomy. It could be deployed, flown in formation with the orbiter and then could be retrieved and returned to Earth. The primary mission of SPARTAN 1 was to perform medium resolution mapping of the X-Ray emission from extended sources and regions, specifically the hot (10,000 degrees C) gas pervading a large cluster of galaxies in the constellation Perseus and in the galactic center and Sco-X-2. in addition the X-Ray emission from the nuclear region of our own Milky way galaxy were mapped. SPARTAN 1 was a rectangular structure, 126 by 42 by 48 in. (3.20 by 1.06 by 1.22 meters); weight 2,223 lb. (1,008 kg) including 300 lb. (136 kg) of experiments. It was deployed and retrieved using the Canadian-built robot arm. The satellite was designed to accommodate experiments that require stellar or solar pointing and establishes its inertial reference using gyros and a cold gas Attitude Control System (ACS). The ACS, controlled by an internal micro-computer, obtained an initial fix from the sun and two guide stars, Vega and Deneb, and then pointed the detectors at the desired celestial targets. All scientific and engineering data were recorded by an on-board tape recorder. No telemetry or command link was provided. Power was provided by internal batteries. 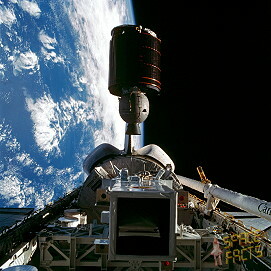 When SPARTAN was retrieved and the Shuttle returned, the recording tape were removed and sent to the Goddard Space Flight Center where scientific data tapes were generated. The SPARTAN "family" of short duration satellites was designed to minimize operational interfaces with the orbiter and crew. The only interfaces are latching, release and berthing support, deployment and retrieval, and turn-on and checkout by the crew prior to deployment. By keeping the interfaces to a minimum, it was possible to operate the SPARTAN autonomously and minimize both demands on the orbiter timeline and impact on other experiments. Sultan Salman Al-Saud, the Saudi Arabian Arabsat payload specialist, took part in four scientific investigations: Earth Observation, Phase Separation, Ionized Gas and French Postural Experiments. Salman Al-Saud photographed Saudi Arabia during Discovery's daylight passes over its southwestern region with a 70 mm camera from orbit. The photographs were be studied by Saudi scientists at the research institute, the University of Petroleum and Minerals in Dhahran, Saudi Arabia. They also were compared with previous data from multispectral scanner, thematic mapper and radar images (SIR-A and SIR-B). Analysis covered geological features, sand dune morphology, hydrogeological features, turbidity in the Red Sea, urban areas and forestry. In another experiment, two liquids which do not mix on Earth were studied in microgravity. They were referred to as "phases." Using Phase Separation Experiment hardware developed at the NASA Marshall Space Flight Center, Salman Al-Saud placed various concentrations of Saudi, Kuwaiti and Algerian oils mixed with water in a hand-held, transparent Plexiglas container with 15 chambers, each having a small metal mixing ball. He shaked the container and mount it in front of a fluorescent light, then photograph the separation and record his observations. 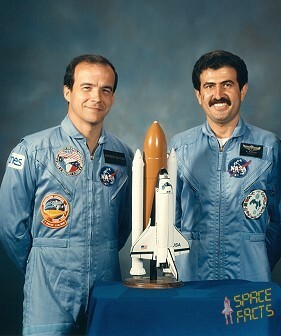 The Ionized Gas Experiment (ICE) required that Sultan Salman Al-Saud, using the Orbiter Discovery's TV cameras, recorded thruster firings in specified configurations to study the mechanics of thruster plumes and the degree off Ionization produced. This experiment was part of a Saudi Arabian student Ph.D. thesis at Stanford University. Purpose was to assess the thruster plumes effect on operations measurements and communications associated with space vehicles. The data obtained also were analyzed at the university of petroleum and Minerals for a better understanding of the impact of gas particles on solid surfaces. Salman Al-Saud also photographed the Arabsat satellite's rocket engine firing. Salman Al-Saud assisted French payload specialist Patrick Baudry in the postural Experiment on the adaptation mechanism of the sensory motor activities. This included posture stabilization and orientation and the role of vision in posture control and reflex mechanisms that stabilize the retina. Requiring about 3 hours, the experiment was performed before, at the beginning, during the middle and last day of flight two times a day. 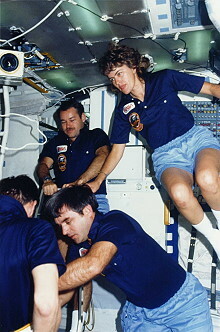 The French Echocardiograph Experiment (FEE) and the French Postural Experiment (FPE) were flown on flight STS-51G as part of a cooperative project with the Centre National d'Etudes Spatiales (CNES) of France. 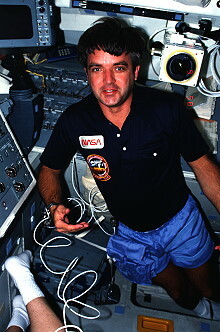 The objectives of these experiments were to obtain on-orbit data regarding the response to weightlessness off the cardiovascular and sensorimotor systems. The system was previously flown on the Soviet Salyut mission Soyuz T-6 in July 1982. 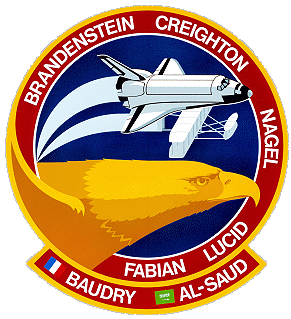 These experiments accompany were performed by the French payload specialist Patrick Baudry with participation from other crew members. The human cardiovascular system was adapted to compensate for the constant pull of gravity on Earth. 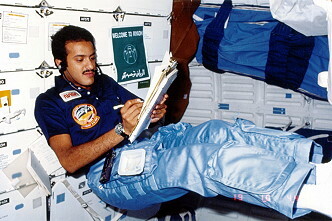 During the first few days of spaceflight the crew was subjected to some significant changes as their systems adapt to the sharp reduction of gravitational effects. Such effects include the temporary pooling of blood in the head and upper torso, with changes in the size of some heart cavities and flow rates in major arteries. Data on these changes and the readaptation to gravity after the mission have important implications for crew health and safety. The French echocardiograph uses a non-invasive, ultrasonic technique to obtain data on these events. The equipment weighed 176 pounds (79.8 kg) and was contained within two middeck double lockers. One double locker hold the electronics; the second hold the video tape recorder, the control monitor and a stowage drawer. Payload specialist Patrick Baudry performed the FEE supported by mission specialist Shannon Lucid. The human sensorimotor functions may be categorized into four areas: muscular tone, posture, orientation and movement. All these functional modes interact to operate within the constant field of gravity experienced on Earth. Without the physical bias and point of reference provided by gravity, these sensor motor functions must adapt. It was the objective of the FPE to learn more of this adaptive process. A better understanding of this process may provide new insights as to how these functional modes interact on Earth. Parametric measurements of electromyographic activity of muscles, angular head movement and up-and down eye movement were conducted. Measurements were obtained using biochemical electronic sensors, data tape recorders and a camera. The five in-flight objectives of the FPE were: posture and movement; posture and vision; vestibule-ocular reflex; optokinetic nystagmus (involuntary oscillation); and spatial memory. The FPE equipment weighed 17.6 lb. (7.98 kg) and was stored in two mid-deck lockers. 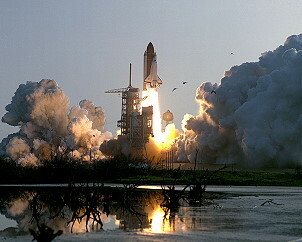 The Automated Directional Solidification Furnace (ADSF) was carried into space for the first time on flight STS-51G. Experiments to be carried out in the furnace were expected to demonstrate the capability of the ADSF equipment and provide preliminary scientific results on magnetic composites. Future missions were expected to demonstrate the feasibility of producing improved magnetic composite materials for commercial use. These materials could eventually lead to smaller, lighter, stronger and longer-lasting magnets for electrical motors used in aircraft and guidance systems, surgical instruments and transponders. Four furnace modules were included in the ADSF, each of which will process a single sample. 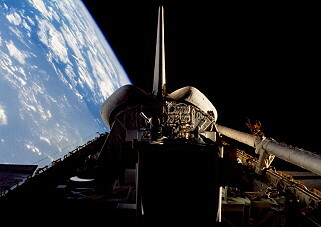 The samplesbeing used during the STS-51G mission were a manganese and bismuth composite. They were processed varying the speed of both the melt and resolidification. Material processed during the mission was then compared with samples of the same metallic alloys processed in laboratories on Earth. The ADSF flight hardware was housed in three separate containers. It weighed about 250 lb. 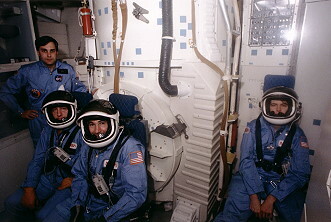 (113 kg) and occupies the space of five crew lockers in the orbiter middeck. Operation of the experiment was highly automated, requiring the crew only to initiate operation of each of the four furnaces. All of the ADSF flight hardware was reusable. 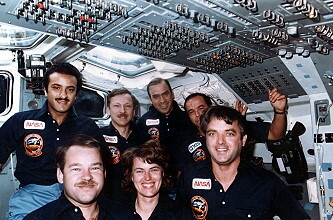 The Strategic Defense Initiative (SDI) Organization planned to fly the first of a series of technology development experiments aboard flight STS-51G. The experiment, called a High-Precision Tracking Experiment, was designed to test the ability of a ground Laser Beam Director to accurately track an object in low-Earth orbit. The High-Precision Tracking Equipment payload consisted of an 8-inch diameter retro reflector mounted in a cylindrical housing. When removed from its storage locker, the retro reflector assembly was attached to the Shuttle's middeck side hatch window in order to receive and reflect a low-energy laser beam projected from a test facility located on the island of Maui, Hawaii. The HPTE failed to deploy properly during its first try on the mission's 37th orbit, because the orbiter was not at the correct attitude. It was successfully deployed on orbit 64. In addition, the crew activated six Get Away Special canisters with experiments in Earth observation, medicine, biology, astronomy. 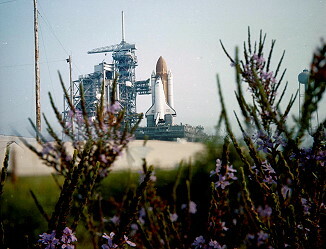 The three West German payloads were used to study materials processing in space and the behavior of liquid propellants. The U.S. Air Force and U.S. Naval Research Laboratory were sponsoring an investigation of the ultraviolet radiation environment in space in another Getaway Special canister. A fifth canister contained a package of nine student experiments in biological and physical science. 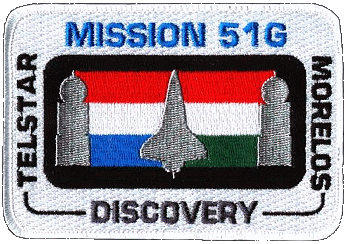 A Goddard Space Flight Center investigation of a developmental beat transfer system was in the sixth canister. One of them shut down prematurely. Last update on January 01, 2019.